The first issue of Secret Empire introduced us to Steve Rogers’ Hydra Avengers: Deadpool, Odinson, Scarlet Witch, Vision, Taskmaster, Black Ant, and Doctor Octopus. 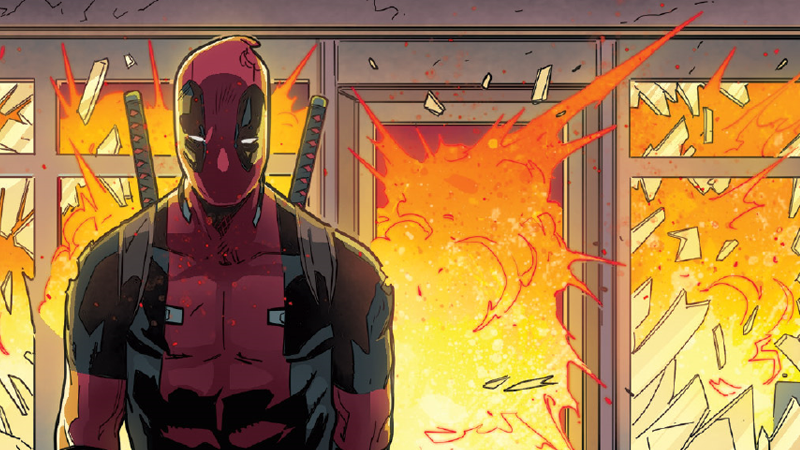 While we still don’t really know why some of these characters signed up for Hydra, this week’s Deadpool shows us why Wade did... and the terrible price he paid to do so. Deadpool #31—written by Gerry Duggan, with art by Matteo Lolli, Christian Dalla Vecchia, Ruth Redmond, and Joe Sabino—is set before the events of Secret Empire #0. It charts a deadly mission Wade takes off the record, on behalf of Captain America, and is told in retrospective. Wade qualifies that he’ll go through hell to stand at the side of Captain America, a man he’s admired since a kid and the one person who ever actually trusted him enough to make him a member of the Avengers. Usually, the dedication Steve inspires in his fellow heroes is a valiant thing, but as with all things Secret Empire, in a world where Steve’s moral conviction is flipped on his head, that dedication is perverted into something horrifying and monstrous. In Wade’s case, that means being given a private mission to execute by Steve that, to the audience, is unconscionable: Kill Phil Coulson, Agent of SHIELD. We also get a flashback to Coulson’s own idolization of Captain America, but unlike Wade, Phil has learned the truth behind Steve’s recent changes, as well as his wild plan to decimate Earth with a Chitauri invasion. However, before he can get that information out to the world, Phil finds himself stalked by the Marvel Universe’s premiere mercenary. Although Deadpool #31 gets some humor in—it is, after all, an issue of Deadpool—it’s mostly a surprisingly somber tale, the story of two different men, loyal to the end to the ideal of what Steve Rogers stands for, finding themselves on two sides of a conflict neither quite understands the full scope of yet. For Deadpool, it’s tragic that his devotion to Steve is blinded to the point he can’t see that something is clearly, horribly wrong with Captain America. For Coulson, it’s tragic because we know as an audience that there’s no good way out for him. We know how Secret Empire begins, in all its gutwrenching glory, and we know that no one was able to get the word out that Captain America was preparing to betray the world in the name of Hydra. So we know from the moment Wade enters the fray that Coulson will fail, and that we’re witnessing the end of one of SHIELD’s finest. First, we see his trusty car Lola, obliterated mid-escape. And then we see Phil’s final moments themselves, nearly locked away if not for Wade’s uncanny healing ability helping keep the door of Coulson’s safe room open. Not even he can convince Wade that there’s a possibility Captain America could be on the wrong side. And so, a bullet to the heart later, Phil Coulson is seemingly no more. Now, this is comics of course, so there’s always a good chance that this was a Coulson LMD, or some other magical load of nonsense will happen to bring him back into the fold once Secret Empire is done. But in the moment, it’s a tragedy to see him laid low—and tragic to see how Deadpool was unwittingly duped into committing the act on Steve’s behalf. By the end of Deadpool #31, Wade doesn’t get the answers from Steve as to why he had to do what he did. He just does what he’s always wanted to do since he was a little kid: follow Captain America wherever he would take him. It just so happens that where Captain America is going is a dark path no one in the Marvel Universe could have expected him to head down.